During the colder months pipes are subject to freezing. Because water expands when it freezes, it puts pressure on your pipes. If your pipes freeze, they can break. Busted pipes can cost thousands of dollars to repair so, if you encounter a frozen pipe, you should take care of it before it’s too late. If you turn on a faucet and no water or very little water comes out, you’re probably dealing with a frozen pipe. Pipes that line the exterior and interior walls of your home are more likely to freeze since they are where your water service enters the home through its foundation. These pipes have less insulation than the pipes in the rest of your home and require extra care when it’s cold out. 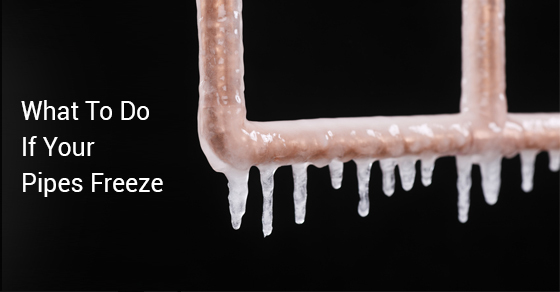 There are four options to unfreeze pipes using household items. These are simple ways to treat frozen pipes that are effective, but take a little time. You will need to keep the faucet open so that when the ice starts to thaw it can flow out of the pipe instead of further clogging it. With an electric hair dryer, blow dry the frozen section of the pipe until water starts to flow from the faucet. This can take a few minutes and require some major patience on your part so be prepared to stand in front of your pipe waiting. Soak towels in hot water and wrap them over the frozen part of the pipe. If you have a portable space heater place it in front but not too close to the frozen section of the pipe. Electric heating pads or electric blankets can also be placed on the frozen areas of the pipe. You should put a mat or dry towels under the part of the pipe you are heating up to collect any water that drips off. Do not under any circumstances heat up your pipes with a blowtorch, kerosene heater, propane heater, charcoal stove or any other device that uses an open flame. This is extremely dangerous and can lead to serious injuries. If you cannot unfreeze the pipe yourself, contact Brothers Plumbing. Calling a professional to help is the best option and can save you thousands of dollars in future repairs.